The principal deity of many Hindus throughout India is viewed as feminine, embodied as the Goddess known generically as Devi. Her individual names and identities are countless. As Mata, Ma, or Amma, she is the Cosmic Mother, from whom all are born. As Shakti, she is pure dynamic power, creating, sustaining, and eventually destroying this world. Householders worship Goddess Lakshmi for welfare and prosperity. This Goddess of Abundance is also regularly worshipped by businessmen to ensure the success of their endeavors. She is the wife of Lord Vishnu Vishnu . For many, like those from Bengal, the most important Hindu Goddess is Durga, the warrior deity who fights evil. She is prayed to for strength. Any of these Goddesses may be worshipped alone as a devotee’s primary focus. 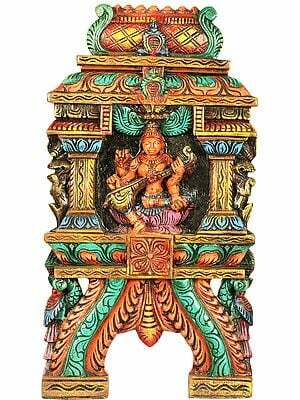 Supremely popular all over the world is Goddess Kali, the wrathful goddess. Her statues inevitably show her in a militant poise with her feet placed on the chest of Lord Shiva. The Hindu Goddess Parvati is the wife of Shiva, and integral to his worship. Together they may be shown conjoined in statues as Ardhanarishvara or fused together as a Linga. Radha is the beloved of Krishna, the darling God of Vaishnavas. Sita, the Goddess wife of Rama, avatar of Vishnu, is the standard symbol of feminine virtue for all Hindus. 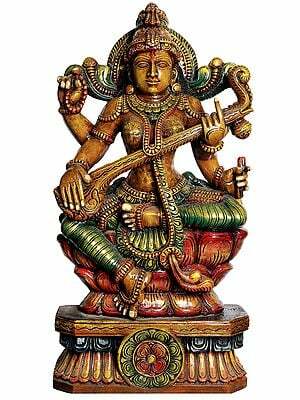 Goddess Saraswati is the consort of Brahma the creator. She is the patron deity of all knowledge in the world. Gender does not appear to affect the personal choice of the devotee—both men and women worship the Divine Feminine. Within any given family it is just as likely that a man’s chosen deity will be a Goddess or a God. The same equality of choice is available to his wife and to their children. 17.0\" X 15.0\" X 5.0\"